Inspirational! Pregnant Doctor Delays Her Own Labor To Deliver A Baby! They had almost induced the doctor, but she paused her own delivery to do her duties as an Obstetrician. Hats off to her! This might seem like a plot of a fantasy novel or even a movie, but it isn’t! An obstetrician who was about to be induced delayed it to deliver another mom’s baby! According to a Facebook post, This is how the story goes! The pregnant doctor was almost induced! Dr Amanda Hess of Frankfort Regional Medical Center, USA was already in the hospital, prepped up for her own delivery. She was about to be induced when she came to know that her services could be needed. And this is how she ended up attending to one last patient before going into labor. 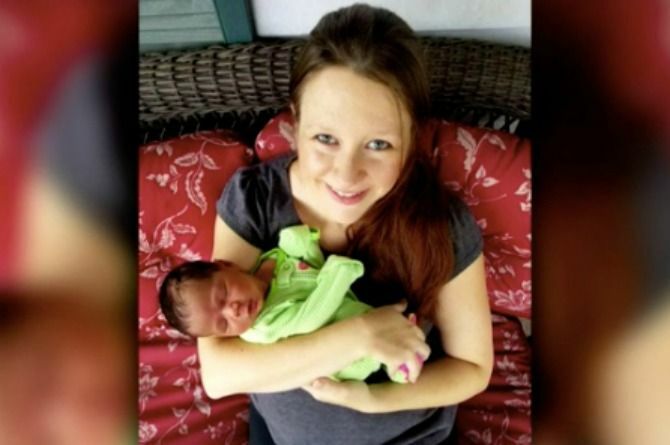 The mom, Leah Halliday Johnson was about to give birth to her 4th child and was already admitted to the hospital. Her obstetrician, however, was not yet there. Dr Hess overheard some nurses who were prepping the patient up, decided to go ahead with the delivery. As told to NBC news, Dr Hess heard that there was a patient in need and the doctor was on the way. She decided to assess the situation and donned some scrubs over her gown, and put boots over her flip-flops! The patient recollects the incident! The mom, Halliday Johnson has a quite amusing tale to tell! According to the report, she had no clue that her doctor was in fact, pregnant herself. Her husband sensed something was different about Dr Hess but was so caught up in his wife’s delivery that he did not give it a second thought. Dr Hess was quite professional, showing no hints of anxiety, something quite uncommon for a woman about to deliver her own baby! Soon after delivering the baby, Dr Hess herself felt contractions and went into labor. She jokingly recollects that she had done a call the day before, and thought she had worked quite till the end. She had no clue that she would be working until the last second! Dr Hess delivered her second child, a gorgeous girl, Emily. Dr Hess has not spoken to Ms Halliday Johnson yet, but both the moms think that their daughters are going to share a common bond. And I am sure Emily will be thrilled to hear the wonderful story of her birth every time she hears it! The world needs more brave women and committed doctors like Dr Hess. "My husband hid that I was a manglik from my in-laws and here's what happened when they came to know..."